This book fills a gap in literature; that of successful business forged through the close relations of businessmen with political power - the so-called “clientelist capitalism” or “budding capitalism” -, which, without a doubt, it is very present in some countries. From the analysis of this bad habit, the regulation that allows it, the governmental and business bodies that go along with it and the corruptions associated with it, the authors, part of one of the most important legal-political blogs in the country examine the causes and, above all, the possible consequences of this practice, which is as old as humankind. The authors diagnose that it is nothing more than the other side of an intimate and poor democracy. 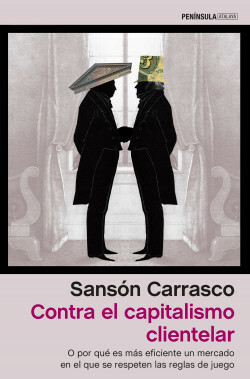 Against the Crony Style of Capitalism is not only addressed to economists or lawyers. The way the market works or how companies are administered is not something that only specialists are interested in: it concerns us all, because it affects us all as citizens. At the end of the day, “clientelist capitalism” is the backbone of an also “clientelist Government” whose most evident external manifestations are the institutions controlled by the interests of a few, and which up until now no one has been able to stop. An analysis of the institutional weaknesses that allows this and why states are unable to stop it.